Gross deception in the insect world was discovered in the Amazon rain forest in the 1850s. 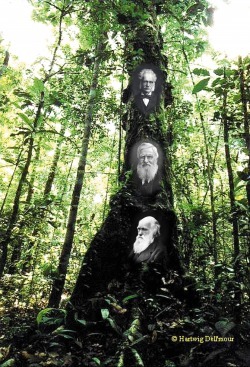 Darwin’s theory was about the burst upon the world and this was the great age of the Victorian naturalist explorers. A chance encounter between the co-discoverer of evolution, Alfred Russel Wallace (1823-1913), and an amateur naturalist, William Henry Bates (1825-1892), in Leicester public library, led the two men to undertake a mammoth trip to the Amazon. Bates was a true Victorian: on returning to England, he said: "how incomparably superior is civilised life to the spiritual sterility of half-savage existence, even if it were passed in the Garden of Eden." But in the Garden of Eden Bates collected many exotic butterflies. When new species are discovered, biologists try to relate them to existing species, discern their affinities, and assign them to families. Although there are many anatomical (and today genetic) characteristics used to decide to which family a species belongs, appearance obviously counts for a lot. Bates was surprised to see that some species that seemed virtually identical in appearance were, when judged by other reliable anatomical features, not closely related at all. In particular, some “whites”, which were normally pale and unshowy (like the familiar cabbage whites), were similar in wing patterning to some gaudy red, yellow and black butterflies of the family Heliconidae. The Heliconidae strutted their stuff in the open in large numbers, as if inviting predatory birds to attack them. They seemed to be distasteful to would-be predators but the “whites” that copied them were perfectly palatable. By means of mimicry the wimps had passed themselves off as dangerous characters.